Antenna Magus version 4.0 released! We are pleased to announce the fourth major release of Antenna Magus. 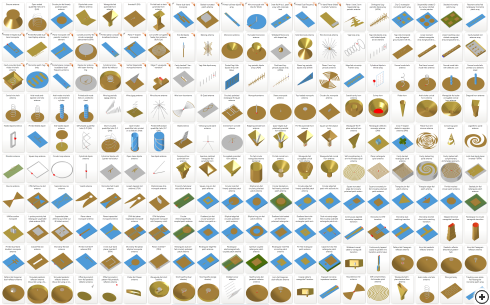 Version 4.0 boasts over 200 antennas - the largest commercially available database of antenna designs in the world - further entrenching Antenna Magus as the leading antenna design tool. 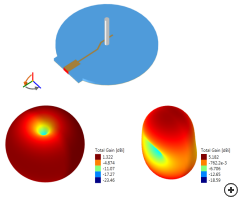 Antenna Magus still offers validated designs, ready to run simulation models and invaluable design information. The accessibility of design capabilities for many applications has been improved in Version 4.0 by the addition of application-specific design options. 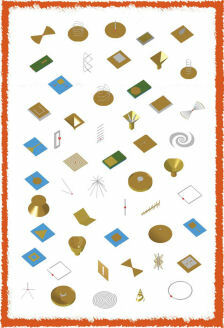 Antenna Magus boasts over 200 antennas - the largest commercially available database of antenna designs in the world. Version 4.0 also sees the addition of 23 new antennas and various additional import and export options. 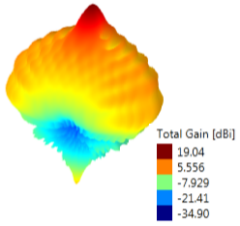 For example, users are now able to import and use 3D radiation pattern data to represent array element patterns when using the array synthesis tool. 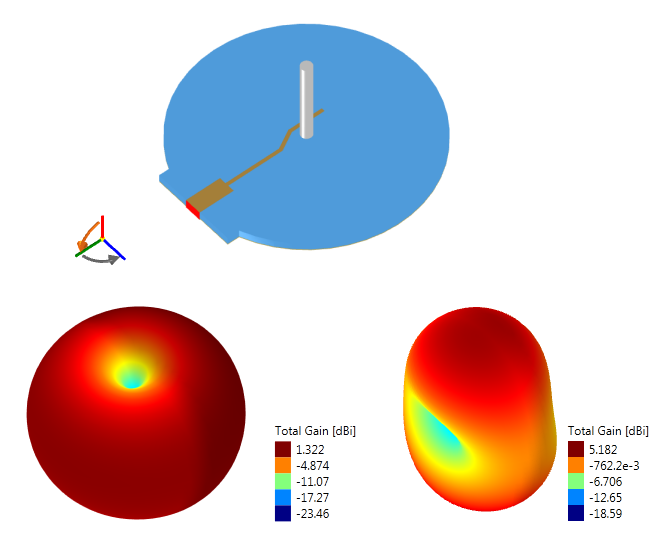 Many information and export model updates, as well as performance and UI improvements ensure that Antenna Magus Version 4.0 aids antenna designers in making excellent antenna choices while simplifying and accelerating everyday design work. 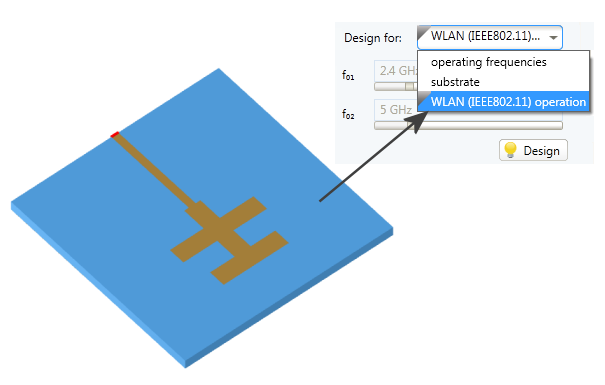 This new feature provides users designing within a particular application with better solutions - both in terms of complexity of antenna topologies as well as accuracy of design. Design groups were added to Antenna Magus to give the user access to pre-optimised designs and structures that are tailored to a specific well-defined application - such as integrated GSM, WLAN, Bluetooth and GPS antennas or designs for standard antennas. The objectives used during the optimisation of these designs (like frequency range, shape and size) are based on the underlying requirements of the target application. Example: The double-t monopole antenna now includes the application-specific design option for WLAN (IEEE802.11). 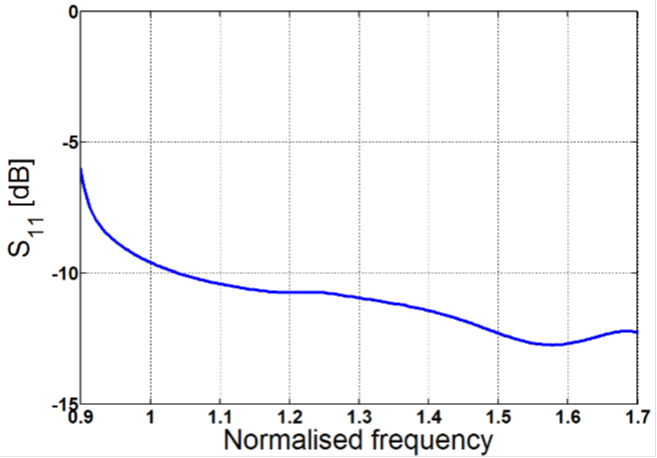 A further advantage of the pre-optimised designs is that pre-calculated estimated performance results are included in the Antenna Magus Database. These can be viewed instantly without requiring any performance estimate calculations. When using an application-specific design, the model export capabilities are exactly the same as for any other design in Antenna Magus. Wire monopole with annular-slot antenna for WLAN composed of quasi-omnidirectional radiators. This allows for pattern diversity capabilities. 23 new antennas were included in version 4.0. There are 23 new antennas added to this release. Each of the added antennas (as shown in the above thumbnail images) is unique with great practical utility and deserves detailed attention. Due to limited space however, only a few examples can be discussed in the newsletter. 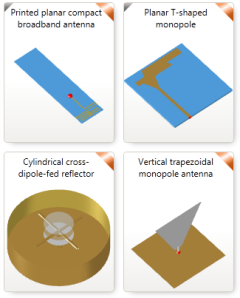 More information on each antenna can be found in Antenna Magus or on the antennas page. 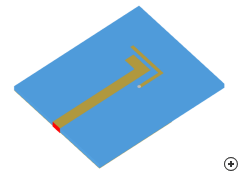 Image of the Tri-band Planar folded inverted-F antenna. Another example of a very useful antenna for tri-band integrated applications (for example GSM/DCS and Bluetooth hand-held devices) is the Tri-band planar folded inverted-F antenna.. 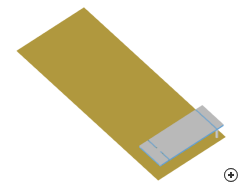 The radiating element is mounted above a conducting ground plane with slots etched out on both sides of the top and bottom metallization layers of the substrate, separating the layers into 5 sub-patches. This rather complex structure may be considered as a combination of simpler structures which interact co-dependently to achieve tri-band operation. 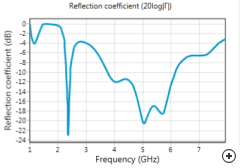 The typical performance for a design for the GSM and IEEE802.11 bands are shown below. 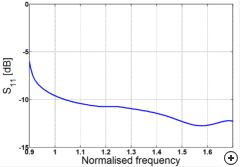 |S11| performance of a design for the GSM and IEEE802.11 bands. 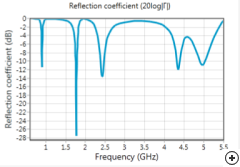 Radiation pattern performance of a design for the GSM and IEEE802.11 bands. Image of the Low-profile corrugated feeder horn antenna (Bulls Eye). 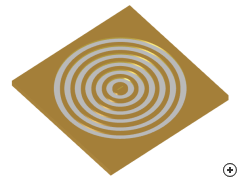 This interesting reflector feed antenna originated from optical studies which showed that sub-wavelength apertures in corrugated metallic films enhance transmission. 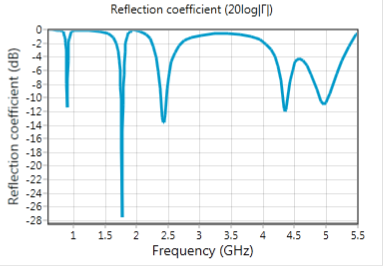 By scaling the same concept to microwave frequencies, a very-low profile feeder antenna with approximately 20 dBi gain can be realized. 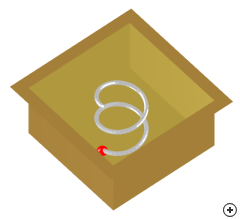 Image of the Cavity mounted Axial-mode wire helix. The requirement for a broadband elliptically-polarised antenna which can be flush-mounted on high speed aircraft is common in the aerospace industry. This antenna inherently fulfils the broadband, elliptical polarisation requirements. It is also mechanically simple, can be flush-mounted and is relatively small compared to other antennas that could provide similar operation at a given frequency. 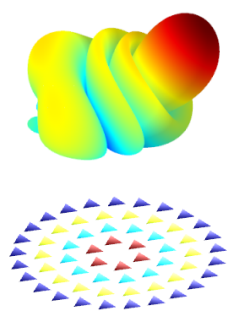 The cavity mounted axial-mode wire helix provides good polarisation purity and constant on-axis-gain over the operating band, as shown in the following 3D circular polarised gain pattern image at three different frequencies in the operating band. 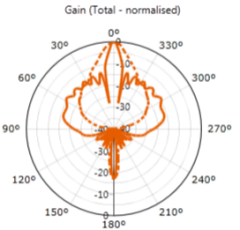 Typical circularly polarised gain patterns at the minimum, centre and maximum frequencies. 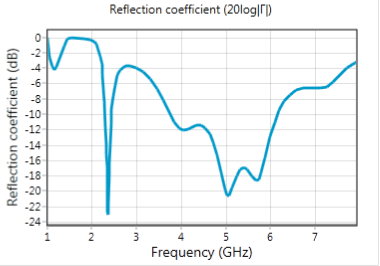 Typical reflection coefficient versus frequency. Apart from the new antennas, 168 parametric CST Studio Suite® and FEKO simulation models and 10 AWR DESIGN ENVIRONMENT® models have been added or updated. Custom 3D antenna patterns can now be used as array elements. The array tool now fully supports the synthesis of array patterns using custom layouts and custom patterns. 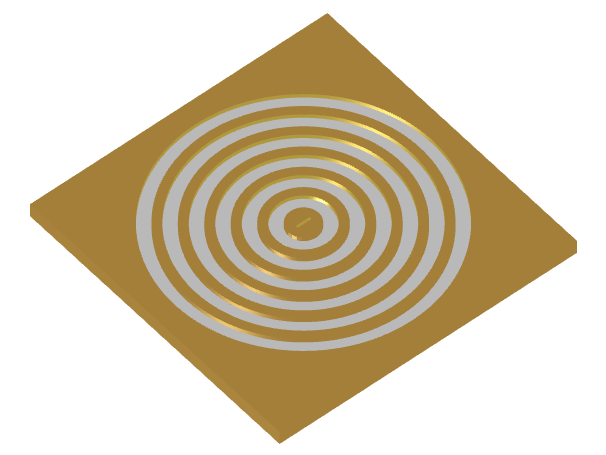 The example shown here is a concentric circular array with 30° tilt angle and imported 3D pattern of a circular EM coupled patch. 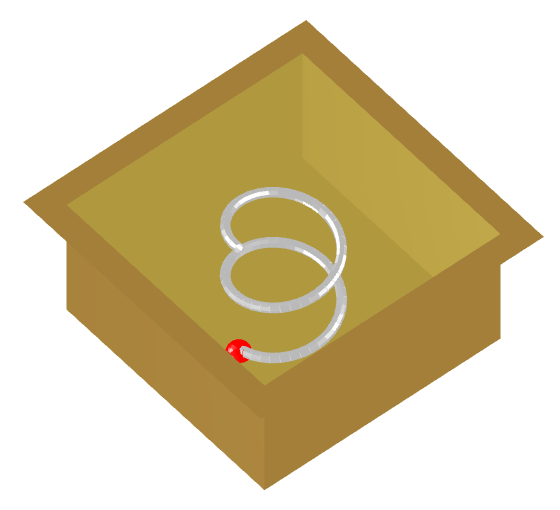 In order to distinguish between new and existing antennas, indicators have been added to the "Find view". Indicators show which antennas are new (red indicator) and which antennas have application-specific designs (grey indicator). These are a small selection of highlights for the version 4.0 release. Please see the release notes page for a more detailed list.